Every year Blue Lodges across the state of California bestow an honor known as the Hiram award upon a single member of their individual Lodge. 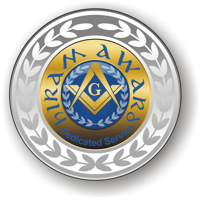 The award is generally described as the ‘highest honor” which can be presented by a Lodge. This can be somewhat confusing, as being Master of the Lodge is also described as being the ‘highest honor” that a Mason can achieve. Technically, both statements are true. To understand the differences, it is necessary to know the history of the Hiram Award, how it is awarded, what it is, and who is eligible to receive it.